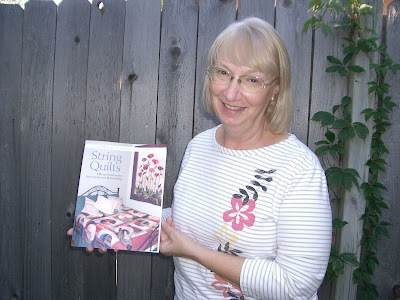 Elsie M. Campbell and Aunt Mimi's Quiltworks: Books, books, and more books! Crystal Star's leaf blocks will have to wait! 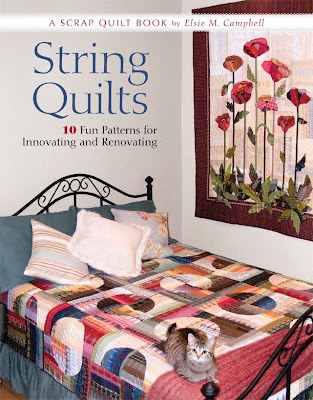 String Quilts: 10 Fun Patterns for Innovating and Renovating is HERE!!!! The books look really good, too! I love the fact that Sally made the cover. She wanted so much to be in the middle of things when we were shooting the photographs, so we finally gave up trying to keep her out of the room, and just let her have her way. It made for a really charming cover. I sent the publisher several possible photos, and I really didn't get to see the cover until about 2 weeks ago, so I didn't know which photo they had chosen. I was really surprised and pleased, too. It is so exciting to have a new book out after a 5-year break. 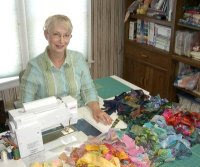 Writing a book is really hard work: First, there is the making the quilts which is pure joy for me. 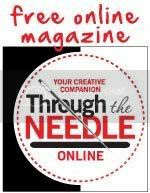 Writing the patterns and how-to's really stretch my brain. I had a lot of help with the photography and graphics part, but the editing step is my least favorite part. Editing is all about compromise, and I'm not always good at that. My editors were fabulous to work with, however, and their point of view and skills are necessary to make the book the best that it can be. 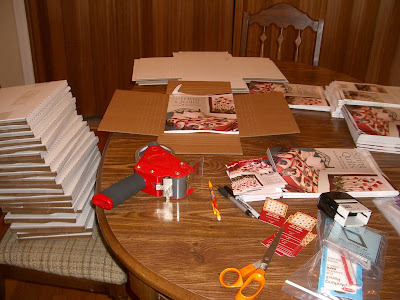 So, today started out with printing invoices, unpacking boxes of books, signing books and packaging and labeling them for shipping. 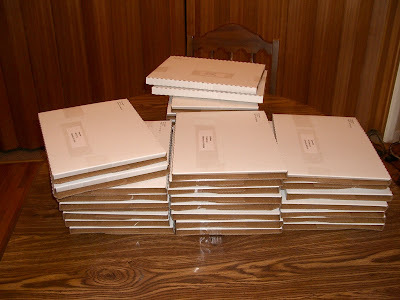 Now, I'm trying to figure out how I'm going to get about 75 pounds of books into the post office for mailing. I thought about borrowing Ken's dolly, but it's really awkward to maneuver. Plus, I'd still have to lift the boxes of books onto and off the dolly, and I'd have to load the dolly into and out of my car's trunk. Just too much trouble. I'll just make 5 or 6 trips to and from the car and hand carry them in. Then, I'll have to stand in line 5 or 6 different times. I'd better allow an hour just for the post office. And then there's groceries to get, a Walmart run for more packing supplies, Sherwin-Williams for house paint and supplies, and UPS to ship a quilt to a show. Such is the life of a traveling quilt teacher/author. Check with the Post Office- they might come to your house for pickup. I think you can prepay the postage or set up an account with them. Good Luck with your book!